Temporary fence rental from Event Solutions provides safety and security for your construction site or special event. Our 6’ x 12’ portable, temporary fence rental panels are perfect for crowd control, traffic control, construction site fencing, and disaster relief zones. If you are planning a special event (festival, concert, trade show, tail-gating event, sporting event, parade, etc. 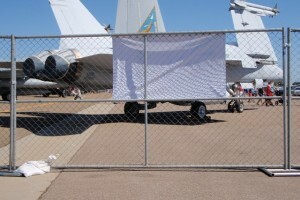 ), temporary fencing may be just want you need to define special areas or provide containment. Call Event Solutions for all your temporary fencing needs.